Last time we spoke about the leaf lace shawl I was waxing the praises of the white cashmere merino laceweight. And it's true -- this yarn is to die for. But I should know better. When I put down a project for months on end, something's wrong and I'm avoiding it. In this case, the needle size just wasn't right for the yarn's gauge. That pic from last November shows the leaves really nicely but in person they're not as clear. I was using a 3.75mm/US 5 and needle and there was more air in those YOs than I wanted. I could have easily ripped and started from scratch but at 825 yards a ball I was going to have lots leftover anyway. So I visited the stash and came up with this. At this much heavier gauge I'm still using a 3.75/US 5 needle. I like it so much more. See? I've had this yarn in my stash for two years, and now I'm wondering why. The pinks are right up my alley, and the touch of purple that works its way in makes me smile every time I knit a stitch with it. That's the happy-happy of it. The crazy-crazy? It's supposed to be knit and blocked by Saturday for the lace knitting class. I faced facts last week and decided that while I like my olympic sweater, it is not meant to be for these olympics. I was finally able to cast on for the Falk version on Wednesday, so there's just no way it's going to happen. Rather than torture myself with it, I'm just going to pick it up and knit on it periodically. Oh! I owe you all a big thank you regarding the alpaca allergy post. I think washing a swatch to see how I react is a great idea. I will give that a try. For now I'm sorta annoyed with the yarn, so it will go in a bag in the stash for now. While working on getting the Falk yarn I cast on for a new sweater. I'm using Stampato. I *love* this yarn! It's one of the stretchiest, bounciest yarns I've ever used. Plus, the colorway is so versatile. It's made up of 6 plies, most of them are black. But there's also a gray/white ply that seems to vary from gray to white to black -- giving it a tweed effect. I'm doing a bottom-up in-the-round raglan -- a pretty basic sweater. I'm planning on doing a V neck with a slit below the V (I don't know what that's called) and some slightly belled sleeves. I got the yarn in the sale bin at Rosie's a couple weeks ago. I bought all they had but I'm a bit concerned about yardage. So, once I complete the body I'm going to do a provisional cast on of the sleeve stitches and knit the yoke. Then, I'll pick up the provisional stitches and knit the sleeves down. Once I'm done with the yoke I'll split the remaining yarn in half and use it to knit each sleeve. No worries about running out of yarn, and I maximize the possibility of getting long sleeves (which I'd really like for this sweater). You knew it was too good to be true, right? Swatching success, colors looking good together, a pattern all mapped out and ready to go. By Sunday morning I was able to do some decent knitting on the sweater. It was chilly all weekend so I had been wearing a fleece hoodie and some pajama bottoms (*perfect* knitting attire if you ask me). When I woke up on Sunday though I felt really warm, so I switched to a short sleeved t-shirt. I sat in front of the TV and got started on some good quality knitting time. Within a half hour the under part of my forearms started to get tingly (the skin, not the tendons or muscles) but I didn't think much of it. By the time an hour rolled around I was scratching and when I finally looked I had hives! I thought about what I had eaten recently (the same breakfast I eat at least 5 days a week). I thought about any other changes I might have made (same soap, same body lotion, same laundry supplies). I was left with one thing...my sweet, soft, cuddly, halo-ey alpaca. I'm allergic to the alpaca! The odd thing is I've made at least 2 things out of alpaca (including a scarf I made back in November). This alpaca seems a bit more hairy than the other alpacas. So, I'm allergic to Frog Tree Alpaca. Damnit. Of course, since I was a good girl and swatched the colorwork, I've now used 8 balls of yarn. So I can only return about half of my order. I've decided to switch to Dale Falk. It's the same gauge as the alpaca so I won't have to modify my pattern. My closest LYS carries it but they were closed on Sunday (due to snow) and regularly closed on Mondays. So come 11 o'clock I'll be calling them and hoping they have enough of the gray. I can always order the other colors online and get them here in a couple days. I know it means I've little chance of actually finishing on time, but like the cross country skiers who see the race to its completion even when they're several lengths behind, I'm planning to stick this one out and give it my best shot. Designing color patterns is hard. Really hard. At one point I had every stitch dictionary and knitting magazine I own spread across the dining room table (you all do this, right?). If I could only merge this stitch pattern with that color sequence and that there border, it'd be perfect. The exercise was very helpful though. In the end I used my Stitch & Motif Maker software to help make a stitch pattern of my own. I finally got to one I thought I'd like. Two rows have 3 colors but I can manage that. I couldn't figure a way to preserve the pattern without it. What do you think? My current idea is that this would be for the band around the sleeves, and for the upper body I'd use this and maybe another small border at the top and bottom. Stranding the alpaca was as hard as I thought it would be. One of the first stranded knitting swatches I made (almost two years ago) looks better than the one I made this weekend. I'm excited for the challenge, but I'm also glad that it's not on the entire sweater. I've been feeling rather unexcited about Rowan 39. The crazy hair, the make up, the (what do you call that?) headdress. In fact, today's post started out with a "not so impressed" theme. But as I looked through the pics again I realized -- there's a lot of possibility in there. Sure, I'm not going to wear 18 layers of clothing with my knitted garments, but there's a lot of things I would really wear -- just in a different context. I'm a sucker for a good stitch pattern, and this all-over one seems to have struck a balance between girly and revealing (no huge gaping YOs). I wouldn't include the gathers (not right for my body type) and I'd lengthen it. But I rarely look at a pattern and say "I'd knit that exactly the way it's been made". The cover design! And once you get past the headgear and the bad 80s belts, it's really quite a lovely design. This could just have easily been made in a softer color and photographed in a setting similar to last year's Butterfly. The flirty ruffle gives it just enough romance, the 3/4-length sleeves make it perfect for in-the-office, and the button up cardi makes it nice layering option for slipping on over top of a tank in a chilly restaurant. I wouldn't use the beads (I *think* I see beads) but that's because I'm just not a bead girl. Leah always surprises me with something different. I love the little braids (i-cords?) across the midriff. I can't tell if they're functional or purely decorative, but they spice up a pretty basic top. She's also added in some puckering at the sleeves to give them a slouchy, casual look. I'll bet this would work up nicely in a denim yarn as well. I read Ann's latest post and saw that RYC (btw, *love* their site! much better than rowan's> released a few new books. I'm particularly fond of Beach. Beach makes liberal use of a new RYC yarn -- Natural Silk Aran -- a blend of 73% viscose, 15% silk and 12% linen. I haven't seen it yet in person but the pics remind me of Tahki Willow. Nice! There are two designs I'm really fond of from Beach. I LOVE LOVE LOVE this top! It's the kind of thing I could see being washed and worn week after week. The shaping and yarn give it a laid back feel, and the edgings -- which look like they're crocheted -- give it just enough wimsy and girly frill to make it not feel like a frumpy sweatshirt. This little top would work nicely paired with jeans and a cotton tank underneath. It'd also be just as lovely with an a-line dress for something a little bit dressier. I would make the top with a square neckline, as I think that shape suits my body better. I'd also increase the length of the garter/rev st st yoke so it didn't cut across my bust. Thank you all for the suggestions last Friday! I was shocked at how many of you commented. You brought up a few yarns that were new to me and I'm excited to try them out (Polo and Tahki Willow come to mind). There is one that I won't be using and that's Calmer. I know it's rather surprising, but Calmer just doesn't knit up well for me. I have bizarre tension problems with it and it makes knitting a real chore. I love the garments I've seen others make, but unfortunately it's not in the cards for me! I'm such a joiner. I have absolutely no right participating in this challenge given the timing (between work and a project that's a surprise and therefore can't be blogged about). But my ability to be an adult and do the right thing is even weaker. I can't show you a picture of what I'll be making because I'll also be making up the pattern. Here's the yarn though. Here's my best stab at a sketch. It's mostly medium gray with shades of blue, tan and brown. The pullover will have a fair isle band across the chest (above the armholes so the front porch isn't overly accentuated) and the sleeves will be bell-shaped with a band of fair isle somewhere near where the bell shape starts. 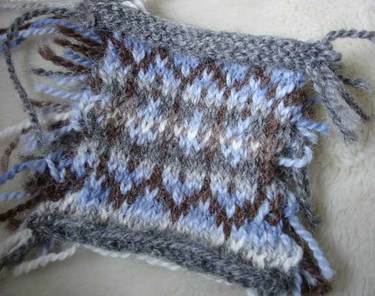 Below the fair isle band I see a rib or drop stitch to enhance the bell. The gauge is a little smaller (22-24 sts over 4 inches) than I'd like for the time, but 100% alpaca is warm and I didn't want to go larger than that. I have to come up with a FI color sequence that I like. I have 8 colors in there so I'm pretty confident I have enough. The surprise knitting project needs to be done beforehand though so I might not be able to figure out the stranded pattern before the start date. My stranded knitting skills still need improvement. If I wanted to make it easier on myself I would have picked a resilient yarn with at least some wool in it. But I just didn't like any of the wool options I came across locally and I wasn't about to pick out 9 colors of yarn based on the way it rendered on my laptop monitor. I've never steeked but given the placement (above the armholes) I will need to unless I want to do standed purling (I don't). Truth be told I'm not terribly concerned about the steeking part but this could be because -- I repeat -- I've never steeked. I do have one thing going for me though, and that's the fact that Paul will be out of town 5 of the olympic knitting days. I would have probably spent much of my time on the couch watching the olympics anyway, so this might just help me focus and follow through on a single project.